The easiest way to build an online WordPress directory website is to install Web 2.0 Directory plugin. As well it is really easy to convert any existing site into a fully featured directory business website with the directory plugin. Wordpress directory plugin for any purposes, and examples would be classifieds, events directory, cars, bikes, boats and other vehicles dealers site, restaurants, pets, real estate portal, wedding site, yellow pages, local directories, map store locator. There are multiple options to to set up revenue generating streams and control them on your personal WordPress dashboard. You can use the plugin for both free and paid listings. The plugin allows visitors to submit new listings or even packages of listings, claim and manage existing listings using the website frontend. 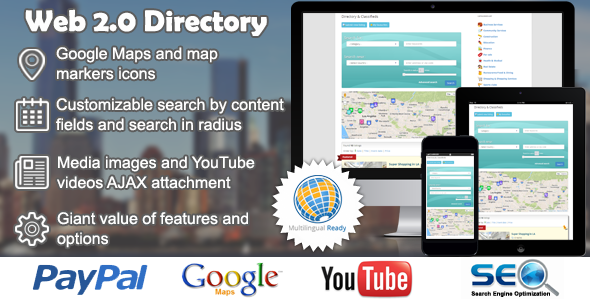 Moreover, it also features location based directory. Maps & map markers functionality gives users fast and easy ability to find nearby places by powerful search system.